Hadley Reed Hancock’s dog training career started early in her youth. 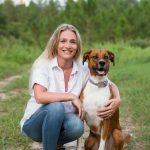 While growing up in southwest Georgia on a 2,000-acre farm and quail reserve she routinely assisted her father and grandfather, who trained Labrador Retrievers for obedience, hunting, and bird retrieval. In addition, Reed trained Pointers and English Setters for field trials and recreation quail hunting. Concurrently, Reed took her personal dog, an Australian Shepard named Jack, through multiple obedience and agility classes. During her high school years Reed Hancock became a nationally ranked pole vaulter, which provided her the opportunity to attend the University of Alabama on a track scholarship. While at Alabama, Reed studied Chemistry and human development and competed on U of A’s track and field team. In her spare time, her favorite leisure activity remained hiking with Jack, who joined her at college. After electing a change in major, Reed transferred to Kennesaw State University, where she obtained a Bachelor’s Degree in Integrative Studies and became a state certified educator. However, she decided that she preferred teaching dogs to teaching children. Therefore, after researching options Reed applied for admission to CPT’s Apprentice Training Program. In adherence with CPT’s qualification process, Reed began by taking her rescue dog Gracie through CPT’s Beginner and Intermediate Obedience classes. She also supplemented Gracie’s training with specialized private lessons. Then, in November 2017, upon her acceptance in the Apprentice Training Program, Reed commenced an intensive education in basic on-leash through advanced off-leash pet obedience, housebreaking, household manners, and behavior modification. Concurrently, Reed continued to enroll Gracie in CPT agility, CGC, and rally obedience classes. To demonstrate Gracie’s prowess, Reed participates in AKC Rally Obedience competitions, where she and Gracie have achieved a Novice title and are presently entered at the Advanced level. In addition, she began training Gracie to perform service/assistance functions as an allergen detection dog. In July 2018 Reed graduated from the CPT Apprentice program. Nevertheless, Reed remains highly motivated to excel in her chosen field. Consequently, she continues to participate in CPT’s internal education programs to further her knowledge, applied techniques, and teaching skills. Reed teaches private lessons, in-home private lessons, boarding, and board training for CPT. She is especially outstanding with young puppies, where her attentiveness and salient adoration of the young animals provides superior outcomes for early developmental board train programs. Whereas many trainers just do the basics, Reed loves taking the pups on dog, human, and environmental socialization outings. She will even sometimes take the dogs swimming. Moreover, Reed is one of the most pleasant and likeable people that anyone will meet. CPT is fortunate to have Reed Hancock on staff.